The Premier League side have announced a new contract for the striker. Arnautovic is staying put in London. MARK ARNAUTOVIC HAS signed a new contract with West Ham in a move the club hope will end speculation over the forward’s future. 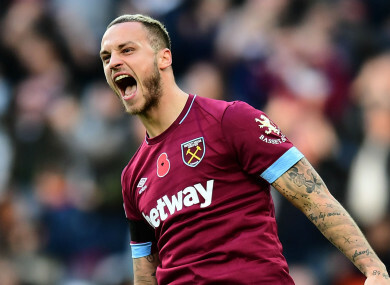 Arnautovic had been heavily tipped to move to the Chinese Super League, having reportedly received a lucrative proposal from Shanghai SIPG, but he issued a statement on social media on Friday confirming he would not be leaving London Stadium. The Austria international has now agreed to a new deal that the club says highlights his “100 per cent commitment to the Hammers”, with the player insisting, contrary to some reports, that he had never refused to play or train in order to force through a transfer. West Ham made the announcement less than an hour after their shock 4-2 defeat to Wimbledon in the FA Cup fourth round, in which Arnautovic did not play. Arnautovic, speaking to the club’s official website, said: “I’m happy for this and I want to say to the fans that I’m happy to stay, I glad to play again, show myself and score goals, to make assists, but also to say that the major point is Marko Arnautovic never refused [to play or train]. I would never refuse. “I’m happy, I’m happy to come to this point. I’m happy that this club is improving. Step by step, every week, every month we are seeing some improvement and that’s good. “Our target, of course, is to climb as high as possible in the league table. We need to start again taking some points. We know it won’t be easy against Wolves away and Liverpool at home. It’s never easy in this league but I’m sure we have enough quality to win games and to climb as high as possible in the table and then we’ll see. “The fans gave me the power, they gave me the energy and that’s why I have to be here and that’s why I want to stay. I never wanted to run away because I hate this club, this was never my intention. Email “China target Arnautovic signs West Ham extension and stresses he 'never refused' to play”. Feedback on “China target Arnautovic signs West Ham extension and stresses he 'never refused' to play”.